Content based on an Environmental Studies Lunch & Learn Talk given to professors, staff, and students at Tufts University. 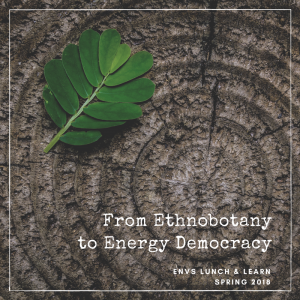 Every week during the academic year, the ENVS Lunch & Learn lecture series features speakers from government, industry, academia and non-profit organizations to give presentations on environmental topics. This is a great opportunity to broaden your knowledge beyond the curriculum, meet other faculty and students and network with the speakers. Students, faculty, staff, and members of the community are welcome to attend. This lecture series is co-sponsored by the Tufts Institute of the Environment and the Tisch College of Civic Life. This semester, the Environmental Studies Lunch & Learn series is off to a great start with an emphasis on justice and respecting the knowledge, needs, and problem solving of indigenous people, women, communities of color, and low-income communities. The first talk of the semester, given by John de la Parra, explored the intersections of indigenous knowledge and medicine, and advancements in the biotechnology sphere that increase consistency of products through standardization and analysis. He began by centering the talk on respecting a woman’s knowledge as powerful, as he explains that in many cultures, medicine people are women who know their way around the local plants. About 80% of the world uses plants to heal themselves. Knowledge of the native plants in a given area points to understanding chemical differences between plants that impact their healing qualities and abilities based on the plants’ own “chemical warfare—reactions to pathogens, weather or drought, other plants, and herbivores.” Ethnobotany pairs the technological advances now available with this indigenous knowledge to grow a huge density of plants within the controlled environment of a bioreactor—needing fewer inputs—to produce concentrated tinctures for different illnesses. De la Parra discusses these lab experiments as a way to dramatically increase accessibility to many treatments by curating very specific and tested directions to grow and create the treatments —and possibly distribute them by drone drop-offs—to people all around the world who may be unable to afford or reach pharmaceuticals. Ethnobotany can produce a product to be used by indigenous cultures to treat existing health problems. 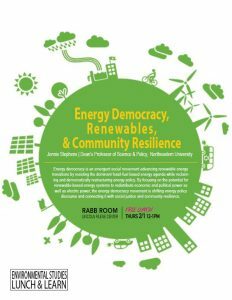 In another talk, Jennie Stephens discussed the movement of Energy Democracy—a concept that connects social change with the energy system transition away from fossil fuels and toward renewable energy. 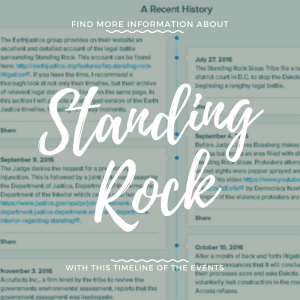 The energy democracy integrates concerns about the environment, climate change, social justice, income inequality, racism, wealth, and human rights. This vision is an alternative to fossil fuel dominated systems, as the fossil fuel industry is the most profitable industry in the world and the biggest contributor to climate change. This resistance is forming as a response to growing inequalities, unequal distribution of the impacts of energy and climate change, and the political power of the fossil fuel industry. Stephens reminds us that we are within this energy transition from fossil fuels, even if we sometimes feel we are stuck without much progress. 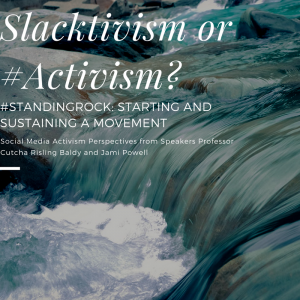 The Energy Democracy sees this transition as an opportunity to democratize and decentralize energy while intentionally advancing justice through inclusion and awareness of the implications and connections between issues of inequality, justice, climate, and energy. Stephens posits that renewable energy systems offer a possibility, but not a certainty for more democratic energy futures. 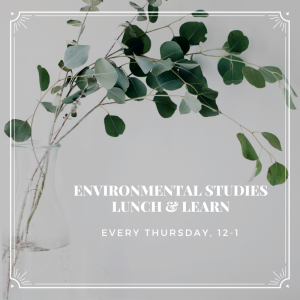 Stay tuned for more Environmental Studies Lunch & Learns highlighting the intersections of the environment, climate change, and justice. We started off our second session by hearing from a current Eco-Ambassador, Rachel Brown, on the office sustainability projects that she has worked on over the years. Then we discussed water, including where Tufts’ water comes from, water conservation projects at the university, and ways you can conserve water in your offices. Carlos Robles from MassRIDES joined us to talk about transportation options and resources available to Tufts employees on the Boston and Medford campuses. We reviewed ways to “green” meetings and events and looked at green event resources on the OOS website. We went over energy use and infrastructure at Tufts, as well as upcoming energy projects and ways to conserve energy in our offices. To end the day, we sorted “Eco-labels” and talked about which are reliable and unreliable and reviewed some purchasing tips and resources. Create a draft community-based social marketing plan using this worksheet. Email to Shoshana by Friday, January 12. Now that you have more familiarity with these topics, it could be a great time to finish the green office certification checklist that you started before, to get your office green office certified. Water Conservation Tips: Visit the OOS websitefor information about conserving water in the kitchen, bathroom, laundry room, etc. Reporting a Water Leak at Tufts: Place an online work orderwith Facilities. Tufts’ Drinking Water: Learn more about Tufts’ drinking waterfrom the Environmental Health & Safety Department. For more information about water on the Boston and Medford campuses, visit the MWRA website. The MWRA regularly publishes drinking water quality reports. Click here for more information and here for an example report from January 2016. The Water Cycle & General Water Information: The US Geological Survey (USGS) websitehas a lot of information about the water cycle and global water distribution. Their interactive water cycle diagram is particularly fun and informative! Drinking Water Regulations: Learn about how drinking water is regulated by the EPA under the Safe Drinking Water Act. Drinking Water Health and Safety: Learn how the Mass Department of Environmental Protection ensures safe drinking water. Bottled Water: Check out this recent articleabout the safety of bottled water from the Chicago Tribune or this article about a bottled water recall in 2015 due to possible E. coli. The Story of Stuff has lots of great videos, including their original “Story of Stuff” video. This video about bottled waterand this one about Nestle Waters in California are particularly relevant given our conversation. Clothes Drying: Check out this information about clothes drying. Tufts’ Commuter Benefits: Visit the Tufts Human Resources websitefor information about how you can get transit passes with pre-tax funds. Transportation Incentives & Regional Programs: folks on all campuses can sign up for NuRide to find carpool partners and earn rewards for your “green” trips. Employees on the Medford and Grafton campuses, can sign up for MassRIDES’ Emergency Ride HomeABC TMA provides incentives to employees on the Boston Campus, including the Guaranteed Ride Home Program. Public Transportation: Visit the MBTA websitefor information on the rail, bus, subway, and commuter boat systems and access to helpful resources such as schedules & maps, reloading your CharlieCard online, and MBTA apps. Tufts Shuttles: Find information about Tufts’ shuttles, including schedules and the live tracker, here. Biking: MassBikeoffers a wide range of bicycle safety and maintenance courses as well as extensive online resources about bike laws, local bike clubs, guides for new bikers, and much more. Learn more about bike safety from the Tufts University Police Department. View the City of Somerville Bicycle Routes map here. General Transportation Info: Visit the EPA’s websitefor information about transportation and climate change, regulations related to greenhouse gas emissions from transportation, and how to calculate your greenhouse gas emissions. For guests traveling to campus: Provide information about how to travel to your campus via public transportation. This page(and its subpages) have some good resources and language. Transportation Brochures and Maps: Visit the Office of Sustainability’s Publications Libraryfor electronic versions of our various transportation-related handouts. Green Event Checklists: Use these checklists to help keep you on track when planning Small In-Office Meetings, Large Off-Campus Events, Large On Campus Events, or Formal Meetings. Conferencing Tools at Tufts: Check out the following resources from Tufts Technology Services website. Energy at Tufts: Visit the OOS websitefor energy tips and information about electricity, heating, refrigerators, and computers. Tufts’ Utilities & Efficiency: Check out the Facilities Services website. Energy Ratings/Certifications: Learn more about EPEATand ENERGY STAR. Green Buildings: Learn more about LEED certification. Purchasing at Tufts: Visit the Tufts Purchasing Office’s website. Purchasing Guides & Eco-Labels: Check out GoodGuide, EWG’s Skin Deep Cosmetics Database, the Responsible Purchasing Network, and the EPA’s site on Environmentally Preferable Purchasing(EPP). Apps: The “Eco-Labels” app from Consumer Reports has good information about many of the labels we discussed (they also have a website). The“Good Guide” app allows you to gauge a particular product’s performance in the areas of health, environment, and society. 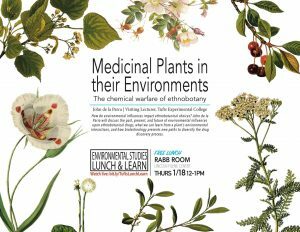 The Environmental Studies program organizes weekly Lunch & Learns about environmental and sustainability topics that are open to all members of the Tufts community (free food is provided!) – learn more and see a schedule of upcoming speakers here. There are CSA farm shares that deliver directly to the Medford and Boston campuses. This is a great way to get fresh produce delivered conveniently to Tufts. Click here for more information. Meet other Eco-Ambassadors at Tufts – click here for a list(you will be added shortly!). Check that you have the proper Landfill and Mixed Recycling labels on your waste bins and that you have a blue lid on the recycling lid. Also, assess if you want a wall sign sticker to go above your waste bins. Please bring a list of what you need to next week’s session. To request a compost bin for your office or a trash or recycling bin, go here. Recycling at Tufts: Visit the recycling websitefor the latest recycling news or for a refresher about what’s recyclable, outdoor compost bin locations, and more! Requests: Request updated waste bins or labels with an online work order. Junk Mail: The University of Texas at Austin’s website has some good information about how to unsubscribe from unwanted mailing lists. Our new Eco-Reps are here! We now officially have Eco-Reps for every dorm on campus and for the first time we have a SMFA Eco-Rep! 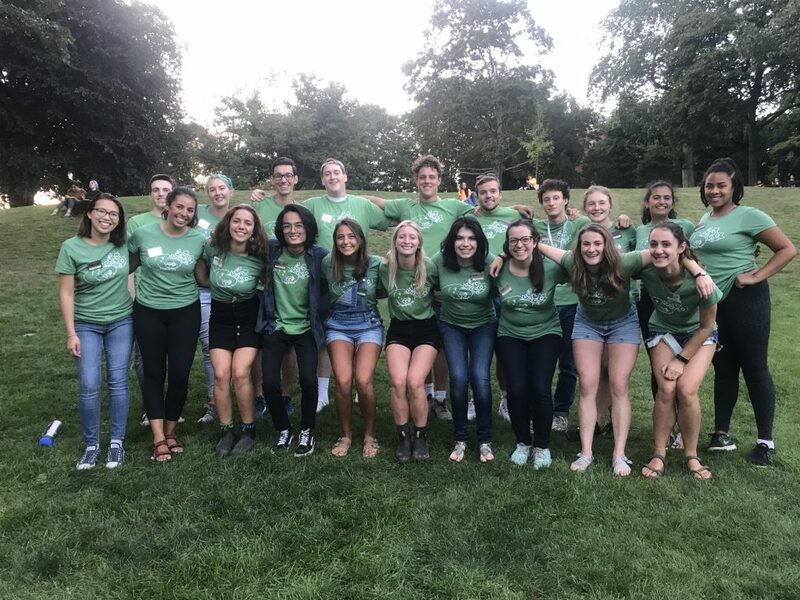 So far the Eco-Reps have helped freshman move-in sustainably, composted over 200 gallons of food waste, volunteered at the Community Harvest Project in Grafton, and helped out at the Blue and Brown Pass Down Sale. It has been quite a busy few weeks! For the rest of the semester, the Eco-Reps will serve as resources for residents in the dorms to help create sustainable living habits. Be sure to ask them any and all of your sustainability questions! Not sure what mixed recycling is? Ask an Eco-Rep! Don’t know where your dorm’s compost is? Ask an Eco-Rep! Have questions about how to reduce your waste while living on campus? Ask an Eco-Rep! Not only can Eco-Reps answer all of your sustainability questions, but they also host sustainability-themed events throughout the semester. Some exciting events planned for this semester include tye dying, herb planting, compost decorating, and pumpkin carving! To stay up to date on all of the Eco-Rep events throughout the semester follow the facebook page! You can also find the Eco-Reps in Dewick on Mondays for Meatless Mondays! There you can pledge to reduce your meat consumption, even if it’s just for one meal a week (every little bit helps)! Don’t the Eco-Reps sound amazing? We sure think so! You can learn more about your Eco-Rep here!